JOHNSON COUNTY—Want a sign of hope that more young men in central and southern Indiana are open to a vocation to the priesthood? Look no further than a soggy field in the middle of a rainstorm. 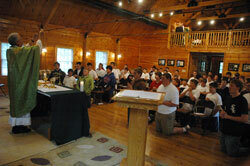 This annual vocations retreat and camping experience for junior high and high school-aged boys sponsored by Bishop Simon Bruté College Seminary in Indianapolis was held from June 14-17 at the Indiana Future Farmers of America Leadership Center in southern Johnson County near Trafalgar. An annual event since 2006, some of its first participants have now graduated from high school. A few, like Joseph Cole and Vincent Jansen, have become seminarians and are enrolled at Bishop Bruté Seminary and Marian University in Indianapolis, where they take classes connected to their priestly formation. Father Robert Robeson, rector of Bishop Bruté College Seminary, sees new junior high and high school students signing up for Bishop Bruté Days, and taking the place of its first participants as a hopeful sign for the future. And that continuing work needs to happen, Father Robeson said, in parishes and families. Bishop Bruté Days—which gives teenage boys a taste of the daily prayer and fun-filled fellowship of life in a college seminary—can only build on that foundation. 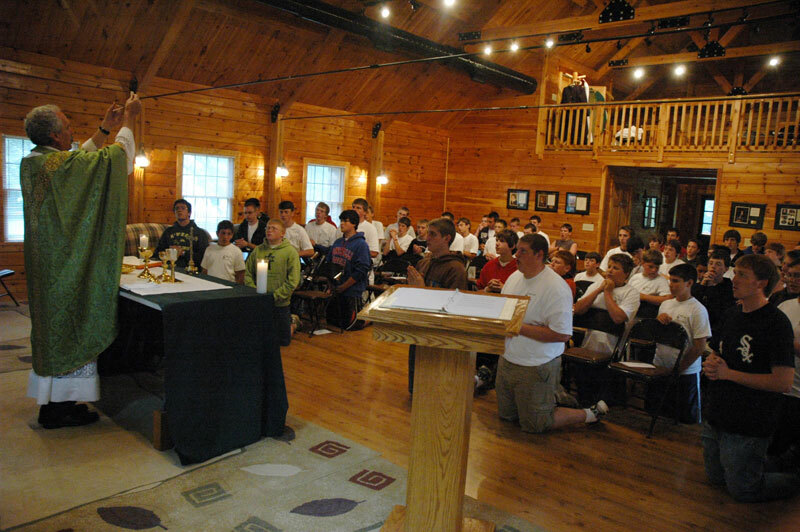 St. Teresa Benedicta of the Cross Parish in Bright in the Batesville Deanery has had several teenage boys attend Bishop Bruté Days in recent years. Its pastor, Father Thomas Kovatch, was so pleased by that participation and so interested in promoting vocations in his parish that he came to Bishop Bruté Days this year to give a presentation to high school participants and celebrate Mass. “To see a lot of them here warms my heart because I truly believe that a lot of them probably do have a call,” Father Kovatch said. It was the daily routine of morning prayer, evening prayer and the celebration of the Mass that helped Cole answer the call to explore as a seminarian the possibility that God might be calling him to be a priest. “It’s similar to the seminary. That’s what got me into the seminary,” said Cole, a member of St. Vincent de Paul Parish in Bedford. Like Father Robeson, Cole is glad to see teenage boys coming to Bishop Bruté Days—much like he did five years ago when he was getting ready to become a high school freshman. One of the youths at Bishop Bruté Days getting ready to enter high school this year was Kyle Fricker, a member of St. Joseph Parish in St. Leon. One of the more satisfying parts of Bishop Bruté Days for Kyle is getting to know the seminarians who serve as counselors. Although Bishop Bruté Days can be a positive influence on teenage boys to consider becoming a seminarian, Father Robeson said that really isn’t its main goal.